The National Society of The Colonial Dames of America in The State of North Carolina takes great pride in preserving artifacts from past members of the Dames. Recently, the membership certificate of Rena Ingram Via was donated to us by a representative from the Anson County Historical Society. Admitted June 10th, 1914, Rena Ingram Via was the 579th NSCDA-NC member. The NC Society currently has a small collection of early member certificates located in the Nimocks Archives at the Burgwin-Wright House Museum. These elaborate documents feature intricate images depicting each of the thirteen original colonies and are affixed with the seals of the National and State Societies imprinted on wax disks. Member names and their qualifying ancestors are written in calligraphy. The certificates were signed by the State Society President and Secretary as well as the National President and Secretary. 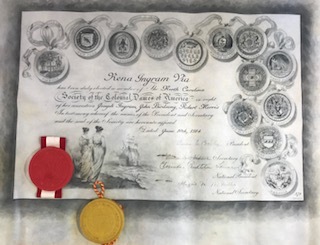 We don’t know when the society stopped issuing this type of certificate, which were produced by Tiffany & Co. We have contacted the company’s research department to find out the full history behind this tradition. Stay tuned!